I’m just back from the excellent MERYC 2017 Conference in Cambridge, where experts from across the world met to share their findings on Early Years Music. They considered what the unborn baby hears inside the womb, how children engage with music during their first few years and how this develops with the help of skilled practitioners. In wider education, there is a danger of a ‘top down’ focus that values exam results and university grades more highly than early achievement. In music education, regional youth orchestras and initiatives such as ‘El Sistema’ catch the headlines. This Early Years Conference was a valuable antidote. In my experience as a parent, the music my children made before the age of eight was vitally important… because it made what followed possible… and it was fun. When I taught music in Secondary Schools, I always made a point of thanking the Primary School teachers whose children came to me already able to sing and play instruments. These children had a good attitude because of their early musical experiences. And I was able to build on that. Early years music teachers are invaluable. Practical sessions at the Conference allowed us to explore and learn like children. As I vocalised noises with a bucket over my head to see what effect these sounds would have on my brain, I was reminded of the simple joys of just playing with sound. Getting down to a child’s level reawakens our sense of fun, of discovery and of the musical possibilities of life. 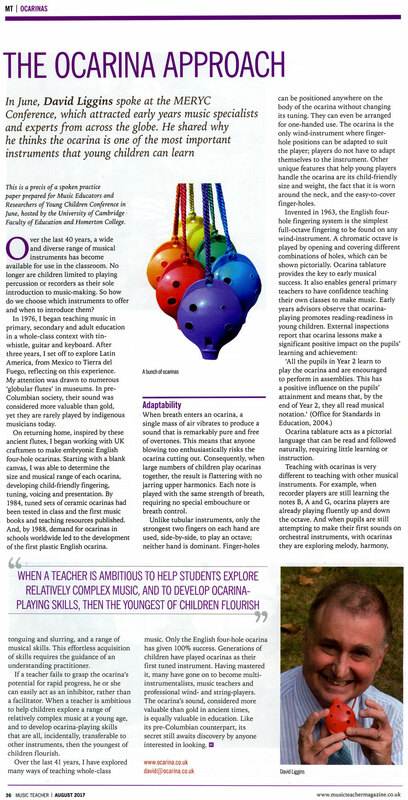 My offering at the Conference was an Ocarina-playing workshop that attracted a massive turnout in a hot room on a sunny day and resulted in much hilarity, and a Practice Paper, a summary of which is published in the UK ‘Music Teacher’ magazine and can be found on this page. 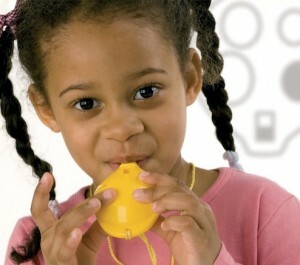 Discover why English Ocarinas work particularly well in early years settings here (UK) and here (International). Thank you to everyone involved in putting on such an excellent conference. Learn more about the Educational Significance of Ocarinas and read about and hear examples of Ocarinas in History. Both of these pages have large A0 posters which were presented at the International Society for Music Education (ISME) Conference in Glasgow July 2017. Play your Ocarina Book 1 – Now in full colour!